The new project is a formula 1, built from scratch. This is more a design exercise than a complex technical attempt. It is one of my first serious tries to build something realistic, humility drove me to avoid the Power Functions and advanced functions at start, the next model will probably radio commanded at least. I started by a beam-made profile, the idea was to see what scale and what wheels to choose. After, i built a first front wing, but it was not robust enough, the second is the one you see in the pictures from the gallery. This is the one I’ve kept for the project. After that, I grabbed my box of panels and started to play with them, trying to find a good configuration, then, I finished the model with LDD. 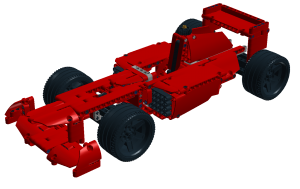 This is what you can see in the gallery, the first complete picture of the Formula 1, fully red. LDD file posted today !